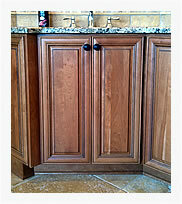 TRADEMARK CABINET COMPANY UNDERSTANDS THAT QUALITY PRODUCTS COUPLED WITH QUALITY CRAFTSMANSHIP RESULT IN QUALITY CABINETS. There are many different door and drawer options to choose from reflecting every style from traditional to contemporary. For more information, please click the link below. 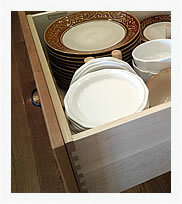 All drawer boxes are dovetailed and constructed from solid wood. 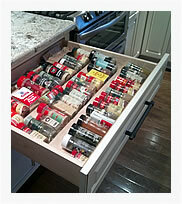 Many custom configurations and specialty drawers are available. A huge selection of organizing options is available. These include roll-out shelving, pot/pan drawers, pull-out waste/recycling containers, spice racks, lazy susans and many others. There are a variety of styles for any taste. For more information, please click the link below. 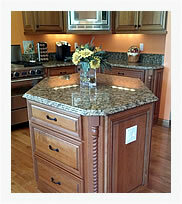 We offer a wide selection of stock granite colors as well as an almost endless number of exotic colors to choose from. 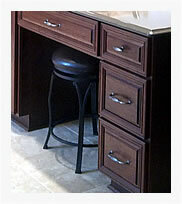 In addition, we also offer a large selection of quartz colors. For more information, please click the link below.